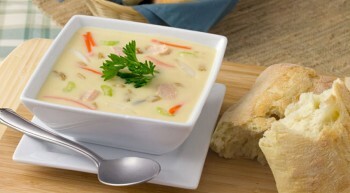 Vanee Condensed Cream of Chicken Soup is made with diced chicken meat blended into a rich and creamy base. Perfect in a bread bowl, as an ingredient for casseroles and entrées, or use it as a base for a signature soup. 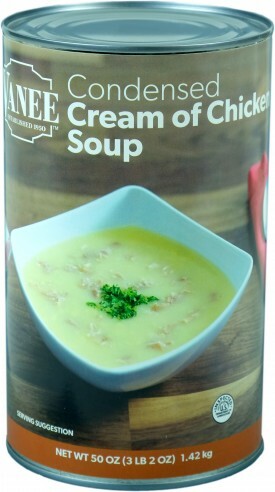 Vanee Condensed Cream of Chicken Soup contains no high fructose corn syrup, no added MSG, saves valuable freezer space by being shelf stable, and unlike the other guys, the third ingredient is cooked chicken meat. Each 50 oz. can has 11 one-cup (prepared) servings, for total of 132 servings per case. Serve 8 oz. 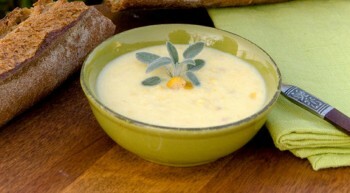 in a bread bowl or soup bowl, or use as ingredient for other soups, casseroles, or entrées. 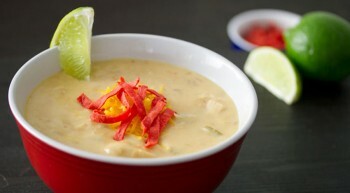 Chicken Broth, Bleached Wheat Flour, Cooked Chicken Meat, Cream, Butter (Sweet Cream, Salt), Chicken Fat, Food Starch - Modified, Contains less than 2% of Beta Carotene, Coconut Oil, Dipotassium Phosphate, Disodium Guanylate, Disodium Inosinate, Dried Chicken Meat, Flavoring, Hydrolyzed Corn Protein, Hydrolyzed Gelatin (for flavor), Hydrolyzed Wheat Protein, Maltodextrin, Mono and Diglycerides, Natural Flavor, Salt, Sodium Caseinate, Soy Flour, Sugar, Torula Yeast, Yeast Extract.